PERF has labeled these materials the ICAT Training Guide (as opposed to a “lesson plan” or “curriculum”) for a reason. The materials provide a new approach to incidents that in the past have sometimes ended with a use of force by police. own safety and public safety. to make adjustments as necessary. parts of a safe and effective response. and this Training Guide were developed and how the two documents complement each other. armed with a weapon other than a firearm. academies to determine how to best integrate this material into their overall training strategies and approaches. skills up to date. Elements of this training can also be reinforced during roll call or team training exercises. and officer safety lie at the heart of the entire Training Guide. techniques on how to approach such individuals, initiate communications, and try to stabilize the situation. accommodate the three basic types of adult learners: visual, auditory, and kinesthetic. the two different learning styles. The Training Guide is designed for these types of learners as well. state-level requirements, and available training resources. exercises. However, individual agencies or academies can adjust the material and the amount of time used to cover it. 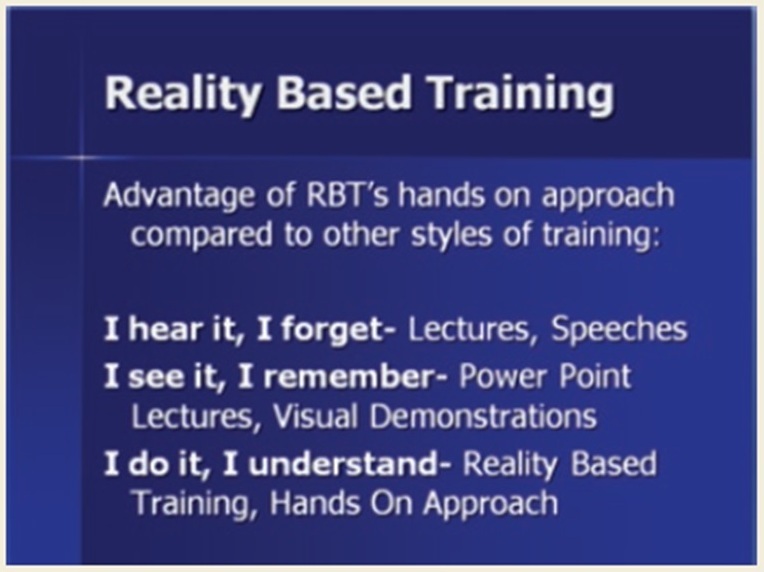 that cover the same learning objectives as those included in the Training Guide. exercises are presented in two ways: as written scripts and, in some cases, as videos of the recommended scenarios. types of adult learners, running actual scenarios is recommended. approach and who are viewed as leaders within the organization. have attributed the effectiveness of the training to this unconventional approach. using anecdotes and experiences from their community. “In Our Own Voice” program could be easily and effectively integrated into Module 3: Crisis Recognition and Response. news media, to observe the training in action. testing protocols. This Training Guide does not include recommended or sample examinations or other assessments. skills sets, in a realistic, hands-on, and sometimes stressful environment. student to experience various situations under stress before they reach the street and experience them for real. The student can experience these situations while in a safe/sterile environment. to conduct their SBT in this same spirit. How to select and coach role-players? calm the person down, and bystanders who may interfere and complicate the police response. Role players must not only understand the parts they are playing; they must immerse themselves in those roles. universities to supply student actors at little or no cost. Run through the entire exercise, and then discuss. more or less compliant? What communications and tactical strategies are warranted given the change in the threat?). behind the frequent breaks in the action. time. By infusing “pauses” into the scenario, the student has more time to come up with the correct answer or action. similar scenario, either in training or in the field. The New York City and St. Paul Police Departments are among the agencies that use this stop-and-discuss approach. not be fully covered in the post-scenario discussion and debrief. highlight a critically important decision point, but otherwise allow the scenario to run without interruption. officers are called on to explain their actions. conduct other follow-up activities, as they would in a real-world encounter. What to do with students not actively engaged in an SBT exercise? involved in evaluating or debriefing with other students; those are the job of the instructors. activities, such as video case studies. What type of investment do agencies and academies need to make in SBT? during one-on-one discussions about an officer’s actions during the scenario. school facilities after hours, and the like. patience is important in handling these incidents. situation peacefully, which often does not mean quickly, and that officers are encouraged to take the time they need. should resolve every incident as quickly as possible, so the officers can move on to the next call.